One of my biggest pet peeves is when authors spend too much time explaining to you what happened in the last book. This bothered me when I read The Fiery Heart by Richelle Mead. It actually almost ruined the book for me. And this re-capping bothered me again in The Iron Traitor. So much time was spent reminding me what happened in The Lost Prince that I kept wondering when the action was finally going to begin in The Iron Traitor. Then when things finally started to take a turn in the right direction Kagawa leaves us on a terrible cliffhanger. I don’t think I would have been bothered by all of the reminders if I had better connected with the characters. The second book should make me love the characters even more then the first book did. In the The Lost Prince I was introduced to Ethan, Keirran, Annwyl, and Kenzie. This book should have made me love them. Instead, I found myself getting annoyed with Kenzie constantly butting in; Annwyl playing the fragile flower, and Keirran blindly charging in to situations before thinking. The only person who didn’t get on my nerves was Ethan. One of the things I loved the most about The Lost Prince was that some of our favorite characters played a role in the story. In this installment Ash, Meagan, Puck, and Grimm do make brief appearances, but they are very brief. 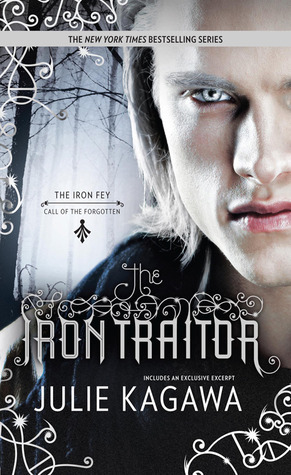 Honestly, in a lot of ways The Iron Traitor was just a space filler to get us to book three. Nothing new really happened in the plot. I think we are meant to have fallen for Annwyl and cared about the relationship between Annwyl and Keirran. Unfortunately, I never found their romance believable. I didn’t understand why these two characters wanted to be together so badly, or why Keirran loved Annwyl so much. She has never really given Keirran a reason to care. I actually wished they would have just let her fade. Okay, okay, that came out a bit harsh. But honestly, I don’t really care for her as a character. I do hope she grows some kind of a backbone in book 3 though. I also hope we finally get to the mystery of the Lost Fey and their queen. Despite not really enjoying this installment I will probably continue the series. I am a sucker for The Iron Fey. It was my guilty pleasure and this spin-off series has the general iron fey structure. Although, without the same heart and soul. Hopefully Kagawa can make me love these characters in the next book. I know if a writer can do it, she is more then up to the challenge. I've lost the battle to continue on with this series after reading The Lost Prince. Don't get me wrong, I liked it enough but I think I've just about enough of this world. I wasn't a fan of The Lost Prince but I did enjoy this one. I was really pissed off about the ending because not only was it a cliffhanger, but we KNEW it would happen.